Sometimes I like to imagine myself back in the year 2013. I know it seems foolish and sentimental to some, this yearning for an old-fashioned, 21st century Paris—a Paris of asphalt roads and gas-powered engines, of dark clothes and books made of paper. But whenever I see those antique digital photos of the capital I’m instantly seduced by their charm and wonder what life was like back then. I run movies in my mind of old-time Parisians going about their daily lives: could they sense the importance of the era they lived in? Did the people of 2013 know how historically fantastic their Paris was compared to all the others? As I write this in my room I hear the cathedral’s towers ringing out. They say the old bells inside them date from that period, having been installed to celebrate the 850th anniversary of the church. Think of that! All of the hundreds of years of history since then, set to the rhythms of those 10 pieces of cast metal. What I wouldn’t give to go back in time and hear them for the first time! 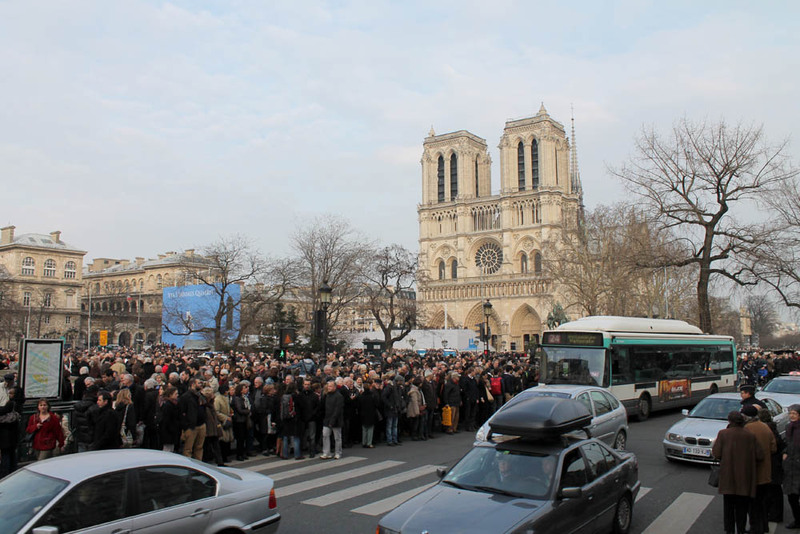 It would’ve been the early evening of a March 23rd, and I would’ve donned one of those quaint Parisian costumes and shuffled into the crowd with a tripod and one of the old video cameras of the time. My ears would’ve delighted in the very first peals of the bells as they mixed with the quirky sounds of 21st century French being spoken. The fanciful din of old ambulance sirens and car horns would’ve completed the scene and I would’ve stood there with my eyes closed, as an infinitely grateful time traveler, taking it all in. I’d be witnessing history. That would’ve been a special moment. That would’ve been a good time to be alive in Paris. I wonder if those 2013 Parisians could sense it back then. Aaaaah! I had a favorite bell tower in Aviano, Italy. I feel like a little kid again hearing this sound. That’s great Dena, glad it could bring back a nice memory for you! I was worried that I wouldn’t like the sound of the new bells — that they would make Notre Dame seem, well, less Notre Dame-like. But they’re beautiful! Thank you *so* much for being there to record this moment, Corey, and for sharing it with those of us who only wish we could have been there. It’s always a pleasure to share these cool moments, because I know people like you would love to be there experiencing it if you could. I know if I were elsewhere dreaming of Paris, I’d be bummed if nobody sent me a vid of the new bells! Glad you appreciated it. I love all the hub-bub and jubilee going on all around you while the bells are ringing! You are right — it feels so historic!!!! I agree Betty, at first I was a bit irked to hear cell phones and dogs and horns honking–but then I realized it was all part of the city soundscape, and that throughout the centuries there was probably always a similar hustle and bustle around the cathedral during notable events. So in a way it had a certain authenticity. Thanks for your comment! I hope you’re well. A short, but creative, post to celebrate the new bells. Thanks so much, Corye, for keeping your promise to report back on the event. How wonderful it must have been to be a part of history like that! Yes Linda it was a neat thing to witness. I would’ve liked a longer “concert”, because I have the feeling the bells are capable of really melodically interesting stuff. I hope to hear more of them, in different contexts, during future walks in the city. Thanks for stopping by! Thanks DE, glad you liked it! That really caeuprts the spirit of it. Thanks for posting. Fabulous! I have chills! Wonderful, thank you for inviting me to this wonderful event. Only through you could I attend! Kudos! You’re very welcome! My favorite part of this blog is that it can bring Paris lovers a bit closer to the city, so I’m happy I was able to do that for you. Thanks for commenting. Thank you for sharing that glorious, beautiful slice and sound of history! I was there 2 weeks ago, taking it all in, but wishing our girls trip was set for late March so I may have taken in those amazing bells with my own ears! Thank you, thank you so much! My pleasure Connie, grateful readers like you are what make this blog worthwhile. I hope you had a great time in Paris! Thanks! I did have a great time indeed : ) What a wonderful experience for you and your wife to be living there and enjoying so much of it! It snowed while we were there, but it didn’t slow us down. Lots of sights, lots of history, lots of bubbly and wine, lots of laughs. Great trip without a doubt!! I think Woody Allen summed up the problem of era-envy best in his movie, Midnight in Paris. I was Gil Pender once, dreaming of spending evenings with Hemingway and Gertrude Stein in Montparnasse cafes; but the Paris of my experience never really existed because it was a melange of what I found when I got there blended with what I had brought with me in my imagination. It is almost impossible to appreciate the present because in it, one is confronted with so much trivia and detritus that only time can filter out to reveal the gold that history remembers. As Gertrude might have said: the bells are the bells are the bells. You’re so right XpatScot, a big part of what we love about the past is that we never have to deal with its trivial grind of daily life, we only see the beautiful images or ponder the meaningful moments. Real life has those great momnets, but they’re sporadic and often tainted a bit by our worries, fears, obligations, etc. It’s interesting to think about. Thanks a lot for your comment! that was so very cool. thanks from los angeles where our lady of angels was just built very recently … she’ll still be standing in 1,000 years they say. Thanks, I’m glad you liked it. It was a special moment and I’m glad I could be a part of it. Thanks for commenting! Thanks so much Catarina! I know I’m late responding…I mentioned this fact in today’s blog post. ;) So glad you stopped by! Nice blog! I really like the way you write about Paris, yes we are really lucky for living here (though I live in the department 92, next to Paris). You know, I feel like we are in the heart of Europe and all the week ends I walk in the city to know it the best that I can (la marche à pied) to learn about all the little details I can. It is hard to explain the feeling about being here, even though I am spanish and it is also a country full of history, but many things happened in Paris that have change the world, like modern art, and there are surprises every where you turn around a corner and paf! voila the beauty. I think that to deeply enjoy it here it is nice to speak french, so you are not like a tourist anymore, but a son of such a beautiful city. Thanks for your nice comment Maria. I’m glad you enjoy the blog. It’s true we’re very lucky to be in such a great part of the world! Loved this post Cory. It gave me a smile and chills at the same time! Glad you enjoyed it Barbra! I’m glad I could share the new bells with those who weren’t able to be there.